THE major trigger for the stock market would be the election results. Apart from this, domestic and foreign investors sentiments are running high with the general assumption that the Modi led Government will return to power. Further, investors should be extra cautious as volatility is likely to increase during the month of April till the election results in May, said CA Kailash Jogani, Past President of the Nagpur Chamber of Commerce Limited (NCCL). In the short run, till the election result, he predicts that the Nifty will move between 10,800 to 11,800 point level. News flow and opinion polls are likely to affect the sentiments of investors at which the market can sharply swing in any direction. If a majority Government is formed then the markets will react positively and rise like anything. We may witness a gap up of 800 points in the Nifty. But, if the there is hung Parliament, then the markets will correct sharply, he added. Anuj Badjate, Director of Badjate Stock and Shares Pvt Ltd said that the FIIs and domestic investors have taken a perception that the Modi Government would return to power with a thumping majority. Taking this into account, the investors are pumping huge amounts of funds into the stock market which is being reflected in the run up by the Sensex and Nifty before the general elections. He advised that the investors should be extra cautious during the elections. Investors should carry light positions as the election results are unpredictable. There could be wild swings and bouts of volatility before and after election results. 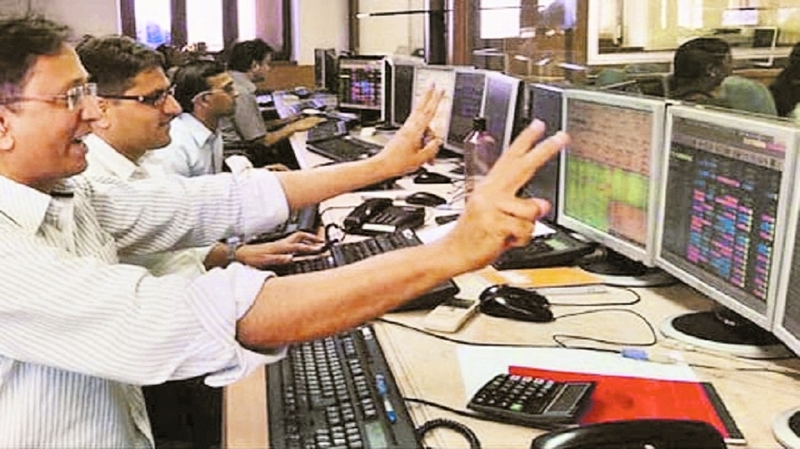 Badjate anticipates that the Sensex could touch the historic 40,000 point level, Nifty 12,200 points and Bank Nifty 31,500 points in April itself. CA Julfesh Shah, Member of CSR and PR Committee, ICAI, New Delhi said, “Dalal Street is known for its unusual and knee-jerk reaction in anticipation of the ensuing general elections and its difficult to predict in which direction the market will move in the pre-election period and after the results.” In the pre-election period generally, the Government’s past actions and election manifesto are considered to be the indicators for the future. Therefore, if investors find Government optimistic on certain sectors then they start betting on the best possible stocks among that industry or sector, which further drives their prices. On the basic level for everyone, the anticipated reforms and plans of the Government drives the market sentiments. “This is the only relation between the stock market and the general election,” he added. Even the biggest rating agencies like Moody’s as well as firms like Morgan Stanley are optimistic about India’s growth story which is positive in future for the stock markets. Looking at the recent zigzag up and down its a bit confusing that where would market lead. Analysis of historical numbers can derive this relation well. It is suggested that for small investors fundamentals is the key area and they can buy such fundamentally strong stocks in the correction phase, he said. It is strongly predicted that if the current Government comes back into power, the market will react in a strong positive manner and Sensex may touch the 40,000 point mark. Sectors like fast moving consumer goods (FMCG), steel, pharma, export oriented stocks, NBFCs etc., will surge ahead and can give good returns, Shah predicted. According to Bloomberg and CNBC guest expert Nirav Panchmatia, the US Federal Reserve deciding not to increase interest rate and increasing probability of BJP coming to power post India’s attack at Balakot has suddenly changed FIIs perception of India and Indian equity market.